1999 Holiday Rambler Endeavour Class-A Motorhome. Diesel pusher, with diesel generator, living/kitchen slide, awnings on all windows, central heat, 2 AC's, power roof vents with rain sensors, washer/dryer combo, rear vision monitor, solar battery charger, queen bed, microwave/convention combo, allison transmission, exhaust brake. average 12 miles/gal. Please call 905-981-8887 for more info. 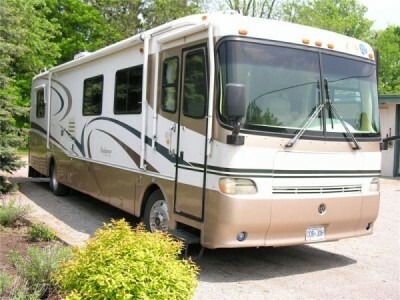 2001 Fleetwood Tioga Superside Class-C Motorhome. Coach on Ford 450 Chassis with V-10. P.S.P.B. AIR STEREO,P.W Cruise Control. All possible Option's with REAR Queen Island Bed, Super Slide, along with 4KW Onan Gen Set Stand up Shower with separate bathroom, lot's of cupboard space with much outside storage, also outside shower with entertainment centre etc. This was bought in Cal. and is in above average condition inside and out, the plastic still on the carpet's. only 40,000 miles and all manuals are with motorhome. This must been seen to be appreciated. Not many from Canada in this condition . Reason for selling not being used enough. Mileage average 10miles per gallon. Please call 780-967-4096 for more information.Found some weather cracking on the tire's so replaced with complete new set of rubber. 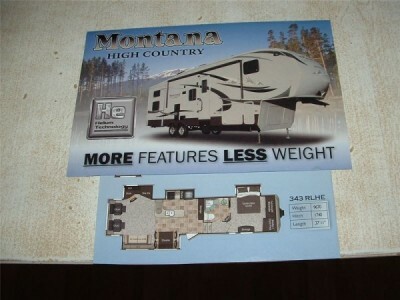 2011 Montana High Country 343RLHE 5th wheel; dual propane, sleeps 4, 4 Slides; Fireplace; Double fridge; 2 TVs (32-inch and 40-inch), Set up for future washer and dryer and compressor; Mint condition; Must see to appreciate. Please call 780-970-7126 for more info. Are you looking for a travel trailer that is unique, ultra modern, very luxurious, and yet light enough to pull with your existing vehicle? The Evergreen Element 24SK might be just what have been waiting for. It turns heads wherever you go. There are numerous engineering features that truly set the Element apart from anything else in its class. There is no wood used in the construction, everything is made from composites so there will never be any rot, ever! It has been engineered to be extremely light and robust.... and it is: 410lbs hitch, 4,200lbs dry weight. Even the propane tanks are fiberglass to reduce the weight and not compromise quality. It is also has the cold climate package which includes ceramic insulation and heat pads on all holding tanks. The interior is more like a yacht than a lightweight travel trailer, soft touch walls and ceilings, LED accent lighting and contemporary cabinetry throughout. There is sleeping for 4 but it is really optimized for 2 with room for guests. 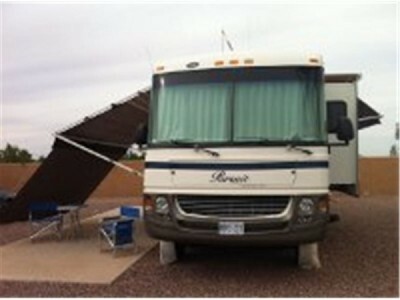 There is also custom removable carpeting and custom RV cover included. We have used this trailer for the last year and had many great adventures; during this time we took advantage of the industry leading warranty to address any of the 'break-in' items found with any new trailer. There are 1.5 yrs remaining on the full factory warranty and another 5 yrs on the premium extended warranty that includes roadside assistance. This is in like new condition and in perfect working order. A change in our situation means we have to find it a new home. Please call 403-805-1511 if interested. 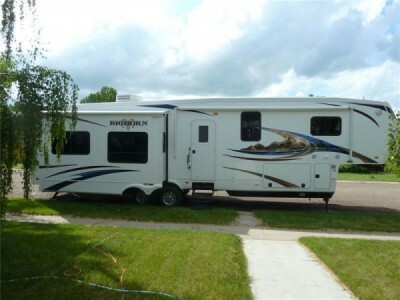 2008 Palomino Thoroughbred T26BHS Trailor. The unit is in brand new condition, only used a dozen times, all amenities of home. Includes hitch and torsion bars. Please call 705-669-7280 if interested. 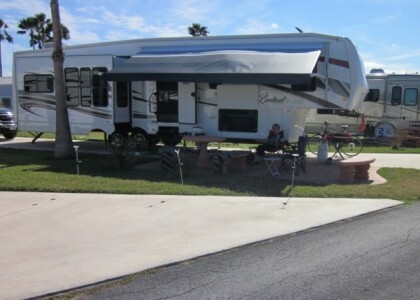 2013 Evergreen Everlite 30KIS Travel trailer for sale! Purchased in May 2012- Used 4 times only. 2 electric tip outs, electric fireplace, electric awning, queen bed, kitchen with island, flat screen TV and built in surround sound. Paint protection and upholstery protection purchased at time of sale. Why pay 13% at a dealer when you can own a new trailer- with less taxes. Paid $54,000 taxes in, in May 2012. Outside picture is actual picture. 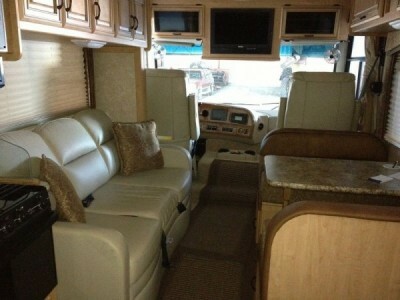 Inside pictures are from the RV website...looks exactly the same except for different colour upholstery. Reason for selling- Cottage purchase. Please call 613-591-2522 if interested. 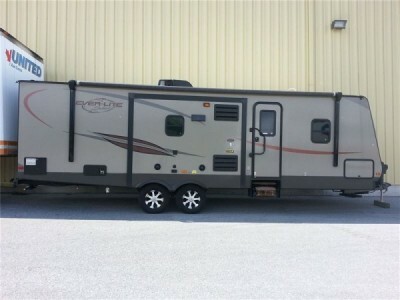 2007 Citation Supreme 33RLTS (33 ft.), triple slide 5th wheel with Polar package. Manufactured in Canada, for the Canadian climate. Holding tanks, fresh water and storage are all heated and insulated. Dual 2-stage furnaces and electric fireplace. Stormtite double glazed thermopane windows, thermopane skylights, day-night fabric blinds, solid wood cabinetry and kitchen table, solid Karadon countertops, 10 cu. ft. fridge. 32” LCD TV, surround sound home theatre system, central vac, washer/dryer, full-size garden tub shower, porcelain toilet, 2 Fantastic fans, bedroom slide awning, loads of storage inside and out. MorRyde pin box system, never smoked in, well cared for, excellent condition. Comes with front storage skirt. See attached photo for floor plan, and complete list of features and options. This unit would make a great live-in. Over $80,000 new. Please call 403-981-8119 if interested. 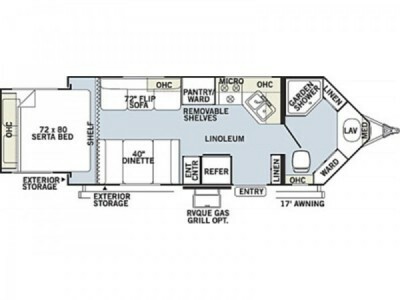 2009 Gulf Stream Prairie Schooner 36FTE 5th Wheel. immaculate 4 slide home away from home, like new, used sparingly, Shaw Direct Satellite dish c/w auto find, 2 TV's and many more features. Moreryde hitch. Electric fireplace. Must be seen to appreciate quality & condition. Please call 403-816-5412 if interested. 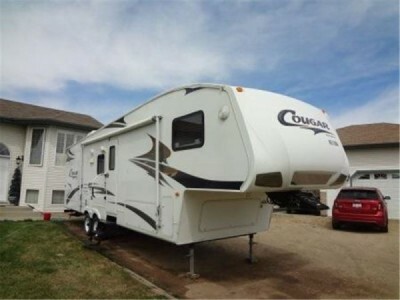 2012 Forest River Cedar Creek 33REA, fifth wheel comes with 3 slides, 2 fireplaces, thermal pane windows, spacious kitchen/living room with and bedroom. Corian counter, dirt devil vaccuflo, outside speakers, electric awning, solar package, "diamond kote" finish on unit guaranteed for 10 years plus other upgrades. Dexter axles, 90 degree turn radius, large basement and roof vent covers. Used one year. Please call 403-601-4544 or 403-601-1146 if interested. 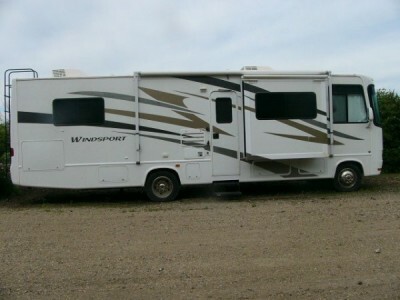 2007 Thor North Wind Class-A Motorhome. V10 Ford. 2-slide outs with awnings. Double sink with covers. Cook top, micro, oven, 2 door ref/freezer. Glass shower enclosure with sky light. Back up monitor. Leather. 2 roof top air cond. 5500w gen. Please call 403-394-8771 if interested. 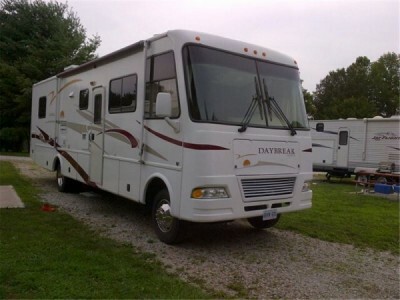 2006 Damon Daybreak 3270 Class-A Motorhome. 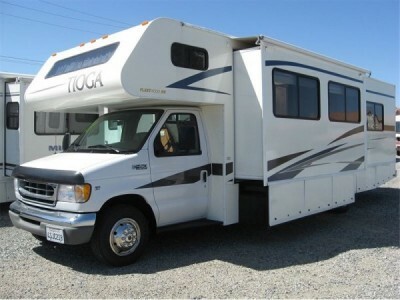 V10 Ford, sofabed, love seat, queen rear bed, new awning, very clean, blue interior. Please call 519-574-6597 if interested. 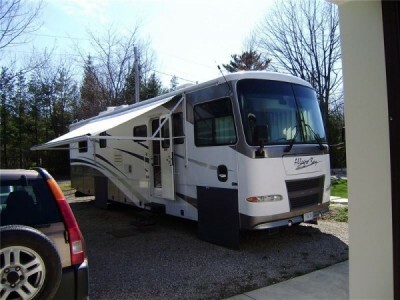 2008 Montago Bay 36 REB-3 5th Wheel. 36-ft with 3 slides. Has many additional options:Automatic satellite TV dish, central vac,2 air conditioners,2 fantastic fans, 19"lcd tv in the bedroom,plum for washer/dryer,generator prep,5th airborne hitch,slide covers,MOR/ryde suspension,power awning,large roll out cargo tray (goes out either side), 2x40lb propane tanks,g-rated tires. Please call 403-831-7971 if interested. 1996 Citation 22LF trailer. Extremely clean and well maintained. 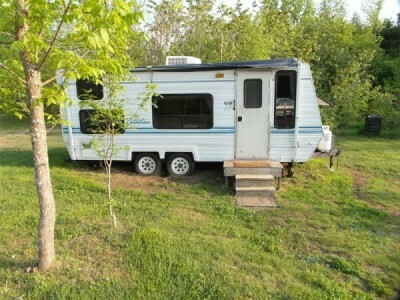 Rear bunks, a/c, sleeps six, full bathroom, new awning, battery and propane tanks. All systems in excellent working condition including fridge, stove, microwave, furnace. Priced to sell. Located near Merrickville. Please call 613-269-4754 if interested. Toilet, Sink, Mirrored Medicine Cabinet, Fantastic Fan. Please call 905-765-2555 if interested. 2005 Forest River Sunseeker 26-feet, ABS Brakes, Air Conditioner(Dash), Air Conditioner(Roof), Awning, DC Converter, Electrical Hookup, Front Overhead Bunk, Shower, Skylight, Toilet, Trailer Hitch, TV Antenna, Water Heater, Ford E450 Super Duty Chassis, 6.8L V10 engine, air helpers in rear, tires two years old, heavy duty trailer hitch, power locks, windows and mirrors, upgraded radio, stored inside over winters. Coach has a super slide (10 ft, for dinette, fridge & closet), queen bed with new memory foam mattress, sleeps six very comfortably, raised oak cabinetry. Please call 705-739-1011 if interested. 2011 Forest River Cardinal 3450RL. 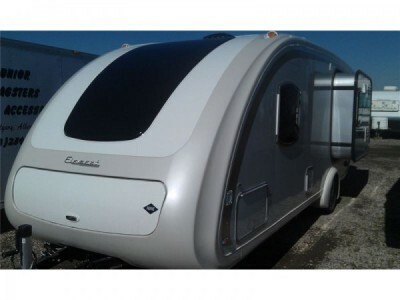 Make an offer on a beautiful luxury 5th wheel for sale. 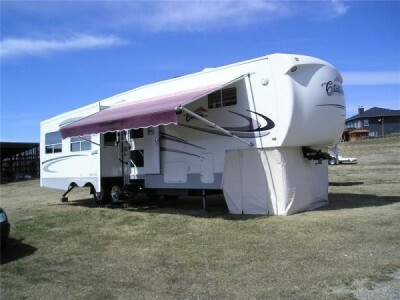 Four hydraulic slides, electric awning, electric front and rear jacks. The slides,Jacks and awning have a remote control 12 gallon hot water tank, 40 gallon grey water tank, 40 gallon fresh water tank, 40 gallon black water tank, all tanks heated to prevent freezing, heated underbelly, tinted windows, lots of exterior lights, king size bed, large mirrored closet, 32" flat screen TV in bedroom with DVD player, porceline toilet, round glass shower, ensuite door to bathroom from bedroom, closet at entranced for jackets, 4 door fridge, oven and micro wave, large Flat screen TV in living room, fireplace, ceiling fan, air conditioner and heat pump, table and chairs instead of a booth, hide a bed sofa in living room, central vac, corean counter tops, all cherry wood throughout, DVD with surround sound in living room. fantastic automatic fan in bedroom. This unit pulls easily with a 3/4 ton diesel. 2005 GMC diesel truck also available if purchased with the trailer. 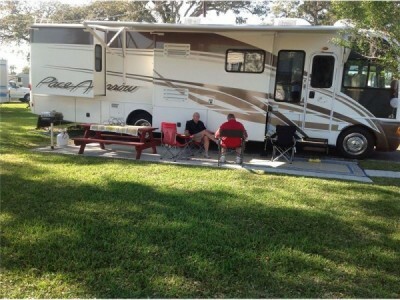 This trailer would be great for full timers, as a winter travel unit, or as a park model. You can Google Forest River Cardinal 3450 RL and get factory info if you wish. Please call 905-679-7428 if interested. 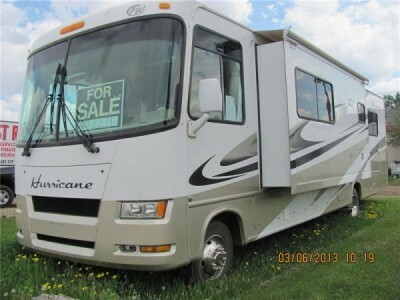 2008 Four Winds Hurricane 33T Class-A Motorhome. 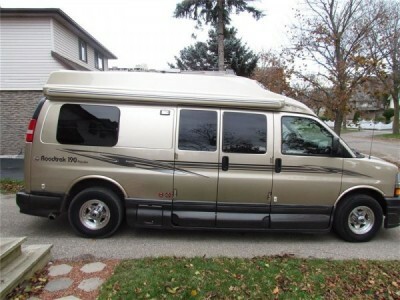 ford V10, 360hp, fully loaded motorhome, self leveling jacks, all leather interior, 5000lbs hitch and wiring, 5.5 onan generator, 2 slides in living area, all slides have awnings, heated tanks, 16 foot awning, rubber roof, blue tooth ready, back up camera, 3 Tv's, large bathroom and shower, queen size bed, smoke and pet free, lots of storage, 100%transferable warranty powertrain and coach much more, must be seen. Please call 780-916-0326 if interested. 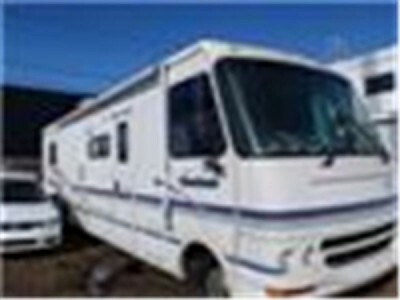 2006 Georgie Boy Pursuit 3500DS 35-Foot Class-A Motorhome. Special Edition, Ford chassis, Triton 362HP 6.8L V10 motor, overdrive transmission, ABS brakes, cruise control, tilt steering, driver door with slider window, custom made driver/passenger table, backup camera, new battery. Interior: swivel/recline captain chairs, swivel lounge chair (available), two oak foot rests, digital antenna and satellite dish, CB, 200watt inverter (suitable for powering laptop), VCR/DVD combo, TV distribution panel, dual ducted roof air conditioners, 2 furnaces, gas/electric water heater, 3TV's (1 outside) and sound system, extra bedroom storage, privacy curtains, 8 cu ft two door fridge/freezer, microwave, oven and stove with hood range, pantry, flip-up desk/book shelf, sleeps 5, 12ft living room super-slide with convertible booth dinette and sofa-sleeper, rear slide-out with large dressing area and wardrobe with mirrored doors, walk-around queen bed, master bedroom privacy wall, private bathroom with corner glass shower, insulated power vents in bathroom and kitchen, day/night shades throughout, computer table with speaker system, No PETS or SMOKING in unit. Exterior: Onan Gold 5.5kw generator with emergency start battery system, Big Foot hydraulic leveling jacks, trunk lights in basement storage, full stone guard across rear, electric double step at entry door, duel deep cycle auxiliary battery system, hot and cold exterior shower, heated/enclosed holding tank, battery disconnect switch, 30 & 50 amp electric supply cords, 15/30/50 amp adapters, 60amp converter, slide room awnings, large patio awning with added sun shade, side window awnings, vinyl wheel cover protectors, side mount exterior mirrors - heated and remote, 20' sewer hose, black tank rinse system, aux use propane tap-off fitting, fog lights, trailer hitch, rear ladder and step ladder, locking gas fill door, operating manuals. NADA (North American Dealer Assoc.) rated at $54,000. Please call 613-931-9508 if interested. 2004 Allegro Bay 37DB Class-A Motorhome. This 37-feet long vehicle has Kincardine Area - W22 Workhorse Chassis, 8.1L Vortec Engine, Allison 5 speed Automatic Transmission, Top of the line Gas Model. Fully loaded. It comes with 2 Slides, Solid Surface Counter-Tops, Tinted Thermopane Windows, Heated Holding Tank and fresh Water Compartments, Holding Tank Flush System, Stainless Steel Sinks throughout, 4 Door Stainless Steel Refrigerator with Ice Maker, Stainless Steel Convection Microwave, 2 Burner Glass Cook-top, walk around "True" Queen Bed with 12" Memory Foam Mattress, Washer/Drier Combo, Central Vacuum System, 32" Flat Screen LCD HD TV, Blue-Ray 3D and DVD Players, Cell Phone Antenna with Amp. CB with Antenna, 10,000lb. Blue Ox Aventa LX Tow-Bar with Safety and Power Cables. "All Recalls Completed"
In addition to the above there are 7 New Bridgestone R250 Tires one in Spare, 4 Bilstein HD Shocks, a Rear Track-Bar, Steering Stabilizer, Synthetic Oil throughout, E-3 Spark Plugs, Taylor "409" Ignition Wires with Heat Shields, a Cold Air Intake with K&N Air Filter and MUCH MORE. Please call 519-395-0579 if interested. 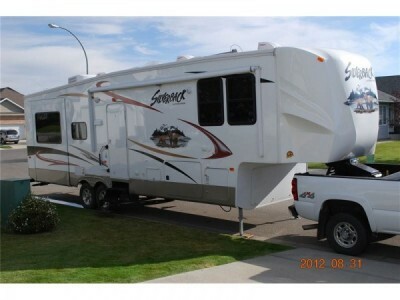 2009 Cougar 293SAB fifth wheel. This unit is in excellent condition as it was used very little. Features include: 2nd bathroom off bunk room. Polar package c/w insulated enclosed underbelly, dual pain windows, heated enclosed dump valves. Oversized double bunks w/trundle bed. Foldout air mattress in couch and dinette turns into be for a full sleep capacity of 9. Outside quick connect for propane BBQ. Outside speakers Outside entertainment (cable) hook up. Cable hook ups in both bedrooms. 32”HD LCD TV in living area and 14” TV in master bedroom. 12v AM/FM/CD/DVD with MP3 Aux. Slide out bike/storage rack. Private sale, no tax. Please call 780-922-1948 for more info. 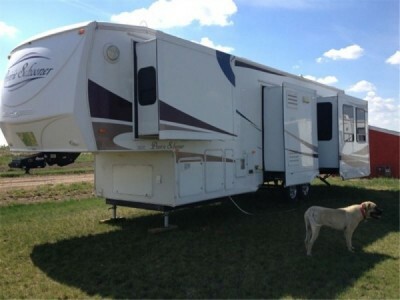 2012 Heartland 3610RE Big Horn Fifth Wheel with 4 Slides. Excellent condition with many upgrades!! King Size Bed/Storage, Mirrored Front Wardrobe with built in shoe storage and washer dryer prep, 20 inch LCD TV in bedroom. Toilet, sink and mega one piece fibre glass shower with sliding glass doors. Large 4 Door Fridge/Freezer with Ice Maker, Large Pantry, Lots of Storage, Convection Microwave, 3 Burner Stove with Oven, Corian Countertops with double stainless steel sink. Free Standing Table 4 Chairs and 2 bar stools. Leather Sofa with storage and built in Queen Size Air Bed and two leather reclining chairs. 42inch LCD HD TV, Electric Fireplace, Ceiling Fan, Sounds around Stereo System with DVD player. 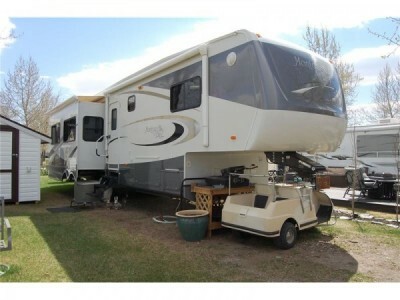 Air Conditioner, Electric Awning, Awnings over all slides, Large Storage Compartments, Central Vac, Keyless Entry. Air trail Hitch, High Gloss Exterior, Privacy Blinds, Fantastic Fan in Kitchen. Please call 403-652-0750 for more info. 2009 Roadtrek 190 Popular LX camper van. Well cared for non-smoker, two owner Roadtrek 190 Popular that seats six and includes a latch point for a child seat tether strap. Upgrades include power rear sofa (seats three) / queen size bed, two no-maintenance coach batteries, detachable power cord, premium in-dash radio/navigation system with 6.5” LCD screen, iPod & Bluetooth cell phone interfaces, storage drawer over cab, new colour backup camera, hanging pantry, wardrobe, 19" flat screen TV, and 6.0 L SFI OHV 16V V8 gas engine upgrade with locking differential and external transmission cooler. Standard features include: Two swivel captains chairs, second passenger chair, home theatre system with 5.1 surround sound & dual centre speakers w/DVD, CD, AM/FM radio, dual use rear speakers; microwave; fridge, sink, two burner stove and front and rear eating areas. Please call 519-894-0657 for more info. 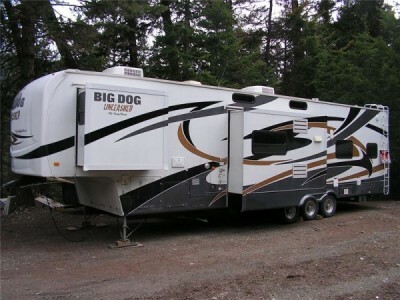 2010 Sunnybrook Big Dog FH401 5th Wheel. 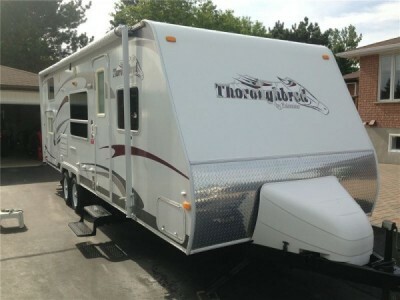 If you are looking for a 5th wheel toy hauler with "everything" then here it is. Triple slide, 12 ft garage, electric bunk beds, smart TV, sleeps 11, fuel station, electric awning, etc etc etc Everything you can think of. 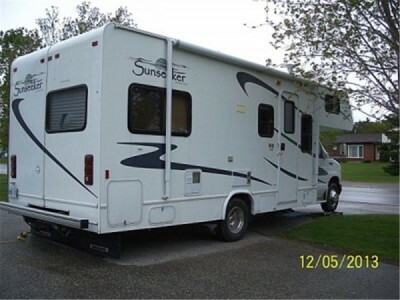 New price over $ 100.000 US Build by Sunnybrook/Winnebaggo top of the line. Bought out of bankrupty but no time to use it. Unit is very very little used Tires like new. PRIVATE SELLER NO TAXES !! Would consider trade in of : boat, motorcycle, UTV, trailer or enclosed utility trailer. Call 250-578-0009 for more info and pictures. 2004 Pace Arrow 37C Class-A Motorhome alongwith A 2002 toyota echo car for towing! Beautiful coach with three slides, leather furniture throughout, washer/dryer, stainless double door fridge, 2 burner amana stove, convection/microwave oven, washer/dryer, electronic awning, 5500 onan onboard generator, 2 TVs, king dome satellite, surround sound, backup camera, electronic jacks/levellers, large bathroom with skylight shower, queen bed, two air conditioners, two furnaces, dual climate control, electronic awning, excellent condition, loaded!!! Too many options to mention. reason for selling: we live on waterfront and don't get to use it enough. REASONABLE OFFERS CONSIDERED! Please call 613-401-5877 for more info. 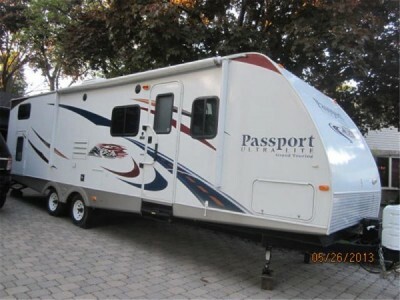 2010 Keystone Passport 2910BH trailer. Like New. Only used 4 times. No time to use it. Fully loaded. Sleeps 10. Full Reese tow package with stabilizer bars incl. Ultra light, can be towed with midsize SUV. upgraded mattresses. 4 bunks at rear. Totally mint condition. Plus, plus, plus. Call 416-569-3428 for more details. 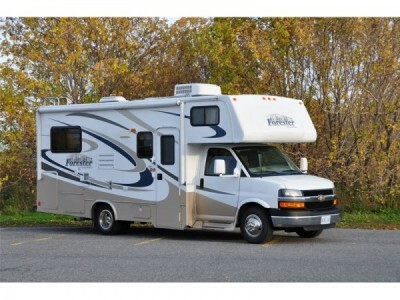 2010 Flagstaff V-LITE 21WRS 21-feet L, Shower, Skylight, Toilet, Trailer hitch, TV Antenna, Water heater, w/rear king bed slide, 4 stabilizer jacks, Raised panel fridge fronts, Convenience Package, Tinted Safety Glass Windows, Gas oven, Microwave,13,500 BTU Ducted A/C, Power Awning, Spare Tire Carrier & Cover, Gas/ Electric hot water heater, Aluminum Wheels, Outside Speakers, Gel coat finish exterior-Outside Grill, Carbon monoxide detector, Water purifier, Create-a-breeze bathroom Roof Vent, Flat screen TV with DVD/CD/AM/FM Radio w/ surround sound and external speakers. Dry Hitch Weight: 597 lbs Unload Vehicle Weight: 4,991 lbs GVWR: 6,550 lbs Cargo Carrying Capacity: 1,559 lbs Exterior Length: 24'7 Exterior Height: 9'10 Exterior Width 96 Fresh Water: 43 gal Gray Water: 38 gal Black Water: 38 gal Awning size: 17ft. Please call 403-828-0445 for more info. 2011 Forester by ForestRiver. 6L Vortec Chev. Motor, like new, 17214 kms, no smoking, hot water & shower, toilet, awning, cruise control, pow. windows, queen serta mattress, furnace, fantastic fan, 22 in. flat panel side TV with DVD, back up camera, 4.0 kW Onan Microquiet Generator,U-shape dinette, micro-convection oven, truck and RV Air Conditioners, TV Aerial any many other advantages. Please call 613-591-1438 if interested. 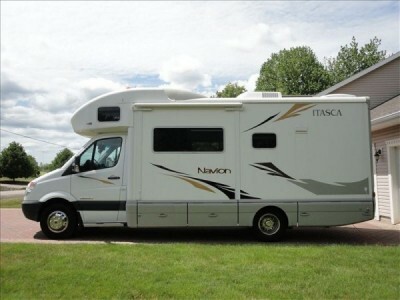 2008 Winnebago Navion Class-c Motorhome. Boasts a very fuel efficient 3500 Mercedes Benz Turbo Diesel engine. Sleeps 6 people easily. Fully computerized Auto-Levelling system. Also contains beautiful custom cherry cabinets throughout. Almost new with less than 30,000 miles. Full Digital Audi-Video system. 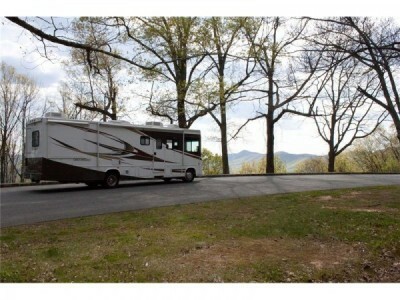 Includes Propane Generator, Gas stove top and large Convectional microwave. Also has full bathroom with large shower.And many other features that must be seen to appreciate. Please call 902-765-2816 if interested.